It has been a 25 years since the introduction of compulsory super. The result is amazing – $2.3 trillion has been invested, a quarter of which is held in corporate funds. 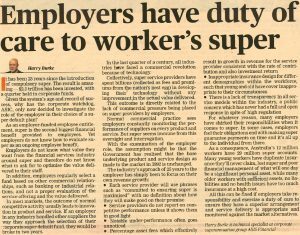 Given the system’s age and record of success, why has the corporate watchdog, ASIC, only now decided to investigate the role of the employer in their choice of super default plan? The ASIC compliance project ‘Employers and Super’ is considering the role employers play in the superannuation system. As an employer-funded employee entitlement, super is the second-biggest financial benefit provided to employees. 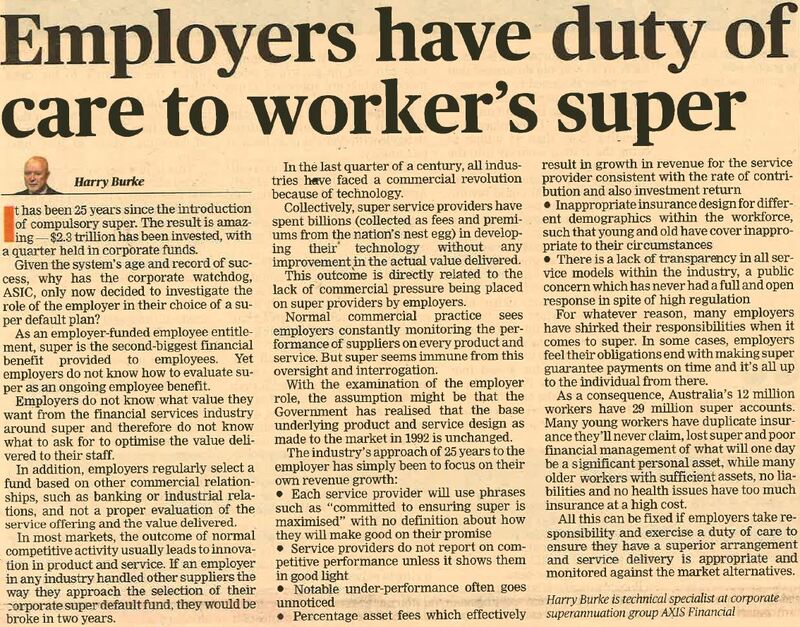 Yet employers do not know how to evaluate super as an ongoing employee benefit. Employers do not know what value they want from the financial services industry around super and therefore do not know what to ask for to optimise the value delivered to their workforce. In addition, employers regularly select a fund based upon other commercial relationships, such as banking or industrial relations, and not a proper evaluation of the service offering and then the value delivered. In most markets, the outcome of normal competitive activity usually leads to innovation in product and service, particularly in any growth market such as super. If an employer in any industry handled other suppliers the way they approach the selection of their corporate super default fund, they would be broke within two years. In the last quarter of a century, all industries have faced a commercial revolution because of technology. Collectively, super service providers have spent billions (collected as fees and premiums from the nation’s collective nest egg) in developing their technology without any improvement in the actual value delivered. This outcome is directly related to the lack of commercial pressure being placed on super service providers by employers. Normal commercial practice sees employers constantly monitoring the performance of suppliers on every product and service. But super seems immune from this normal level of oversight and interrogation. For whatever reason, many employers have shirked their responsibilities when it comes to super. In some cases, employers feel that their obligations end with making super guarantee payments on time and everything is up to the individual from there. Employers do not appear to view super as an opportunity to express the value they place in their workforce. As a consequence, Australia’s 12 million workers have 29 million super accounts. Many young workers have duplicate insurance they will never claim, lost super and poor financial management of what will one day be a significant personal asset. Many older workers with sufficient assets, no liabilities and no health issues have too much insurance at a high premium cost. All of this and more can be fixed if employers take responsibility and exercise their duty of care in ensuring that they have a superior arrangement and service delivery is appropriate and well monitored against other market alternatives.